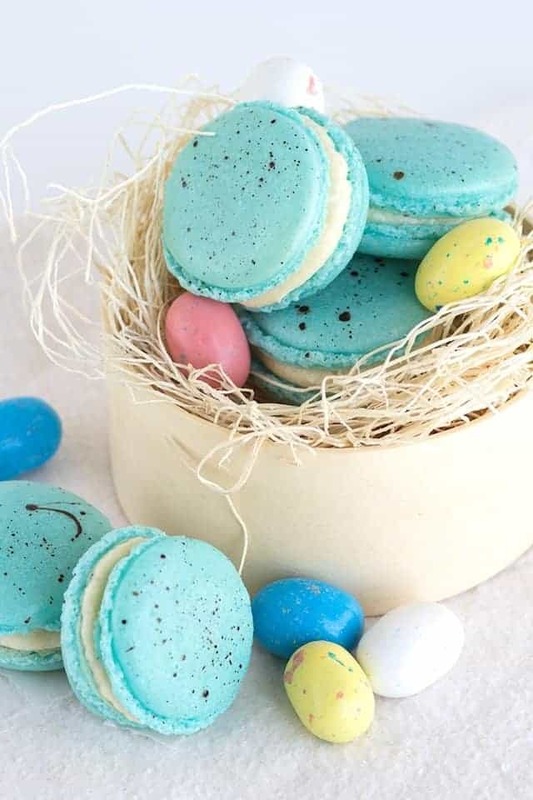 Easter is right around the corner and that means all the stores are going to be full of delicious malted milk candy and pastel colored treats. Both things being the perfect inspiration for my malted milk french macarons. Macarons can be so finicky so I didn’t add the malt powder to actual shell, just the filling. I remember as a child, one year my parents hid my Easter basket and I searched for what seems like hours for mine and my brothers candy. I finally found it, no thanks to my brother. He was older and just got a basket because I did. He wasn’t nearly as excited about the whole experience. His loss. Like all the other holidays, my favorite thing about it is being in the kitchen cooking with my mom. It makes my heart sing. Haha. That reminds me of that song “Wild Thing”. Anyway, it gets a little more tense for the holidays that we have ham at because I cannot stay out of it. My husband is always telling on me for picking at it before we sit down for dinner. Luckily, my parents don’t care. I’m the baby, what can I say? 😉 In your face, husband! 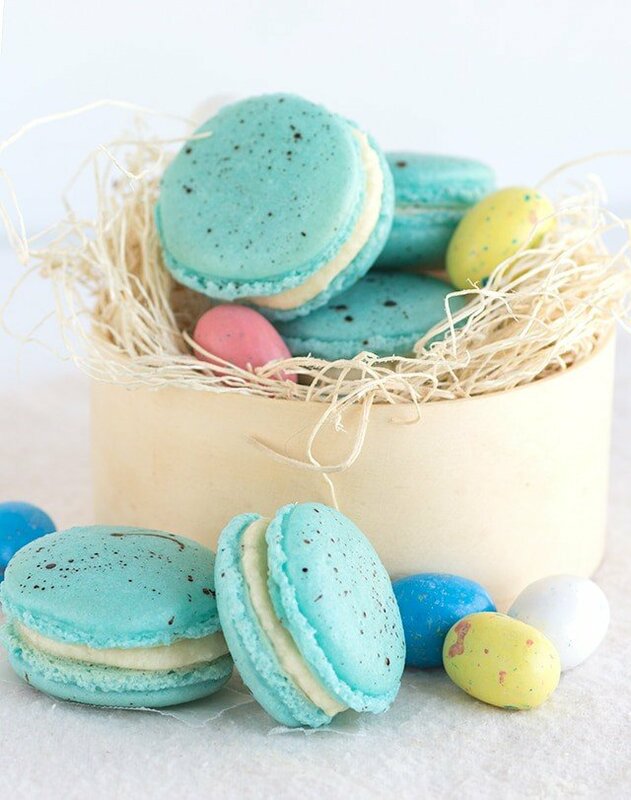 There are a few keys to making the perfect French macarons that I’ve gathered from my experiences. Sift your powdered sugar and almond flour to remove any large pieces of almonds. I’m using Bob’s Red Mill almond meal because they use whole, blanched sweet almonds and the meal is finely ground. Lumpy macarons just aren’t pretty. The egg whites should always be room temperature. This is what you need to look for when the batter is ready. When you pick the batter up onto your spatula and let it fall into the bowl it should move slow but constant sort of like hot lava I guess. One last thing. Let the macarons dry. When you press your finger into the side of the macaron, it shouldn’t stick to your finger at all. It should have a nice shell and that’s when you’re ready to put it in the oven to bake. Line a baking sheet with parchment paper or silicon mat (aff. link). Add in the sky blue gel paste color and give it a quick mix to incorporate. 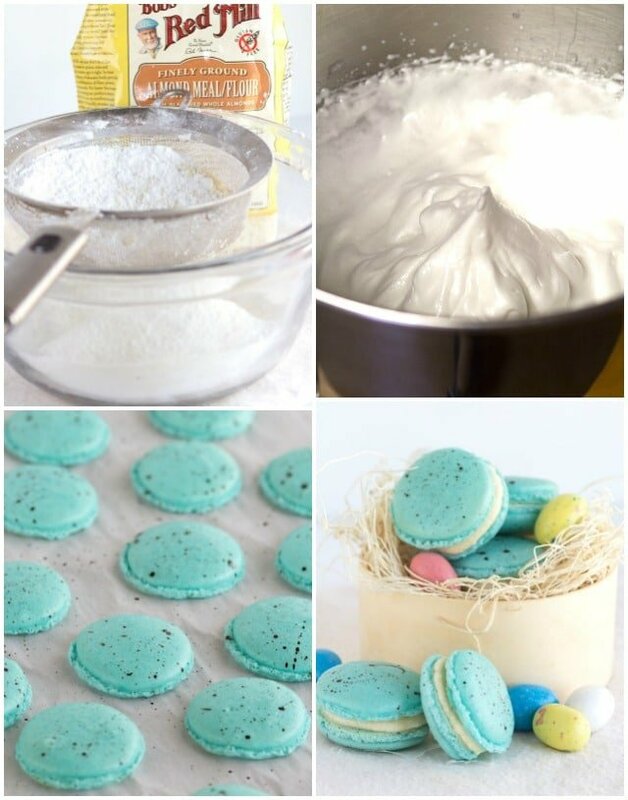 Fill a piping bag with the macaron shell filling. I just used a coupler on the end of my piping bag. Pipe macaron shells on the baking sheet. Once the macarons are completely cooled, add the vanilla and brown in a small bowl. Stir to combine. Using a brand new paint brush and a plastic glove, dip the brush in the brown and flick the brush against the glove to begin adding speckles. Just a warning, put an apron on because you can't really control where the food coloring goes. Once you're content with the speckles, set aside to drive. It took mine about an hour or two to dry. In a mixing bowl, add in all of the frosting ingredients. Mix on low until incorporated. Turn hand mixer on high and beat for 1 minute until fluffy. Add the frosting in the piping bag with a straight tip. 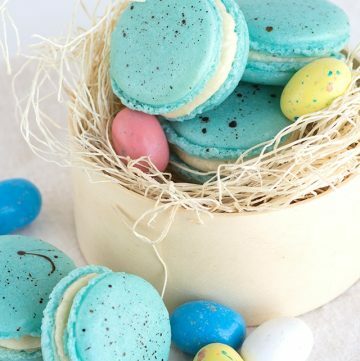 Add a thin and even layer of frosting on the bottom macaron. Add the top macaron and twist to squish the frosting out slightly. 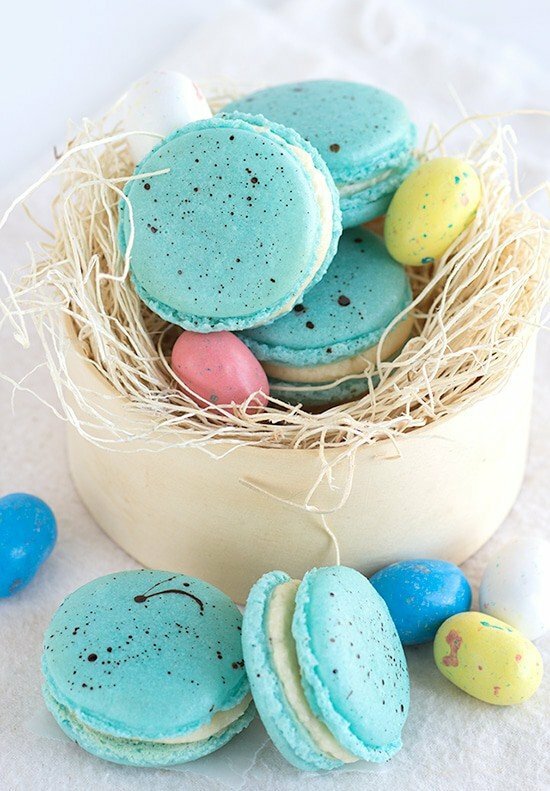 Repeat with all macarons. 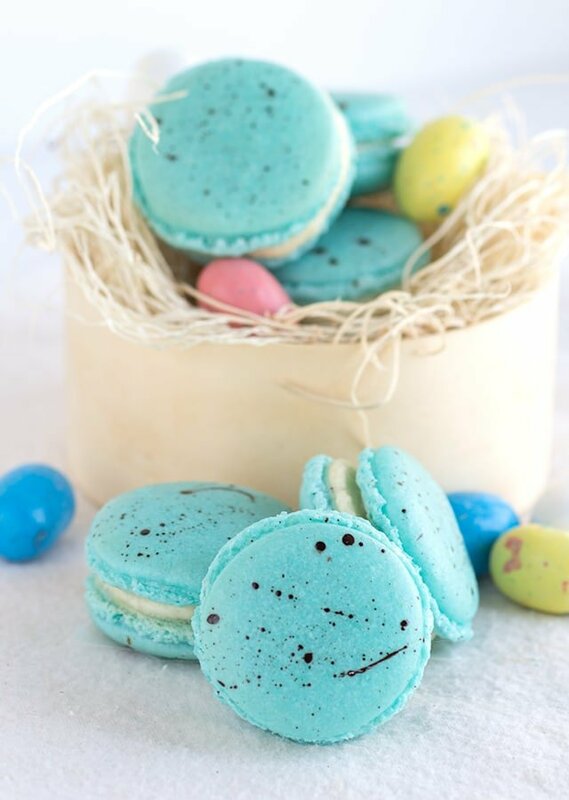 Impress your family with these malted milk macarons. Start by grabbing Bob’s Red Mill $1 off coupon for almond meal. I love these, yours turned out so stunning!